Measuring Guide : Classique Blinds, Not just another blind company! The factory will make the necessary allowances for the blind inside the rebate. DO NOT MAKE ANY ALLOWANCES – always use a steel tape rule. 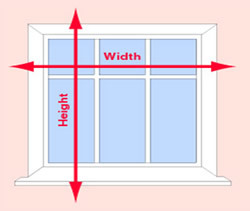 When measuring inside the window reveal, measure 3 widths and 3 heights. Remember to allow enough overlap at each side and at the top and the bottom to provide sufficient cover. The blind will be made to your exact finished sizes. We recommend that you allow 75mm cover at each side and at the top and bottom, remember to check for obstructions. Measure the width and the height of your glass size accurately using a steel measuring tape. 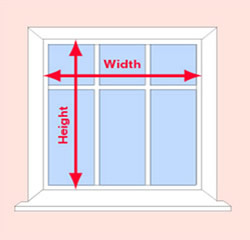 We recommend that you measure in both corners and the middle of your window and use the smallest size taken. This will give you the Perfect Fit frame size. Measure the depth of the wind using a depth gauge. This gives you the measurement from the face of the window frame to the glass. Please indicate when placing your order. Please quote the 3 letter and 3 digit code displayed on your skylight identification plate located on the window frame.